Lost Vape Therion DNA166 Review - Daily Vaping Deals & The Best Vape Product Reviews at Vaping Cheap! For those accustomed to the upper echelon of vape mods, the name Lost Vape will be a familiar one. Lost Vape are known for their high end, well performing products that always look stunning and are dressed to impress. 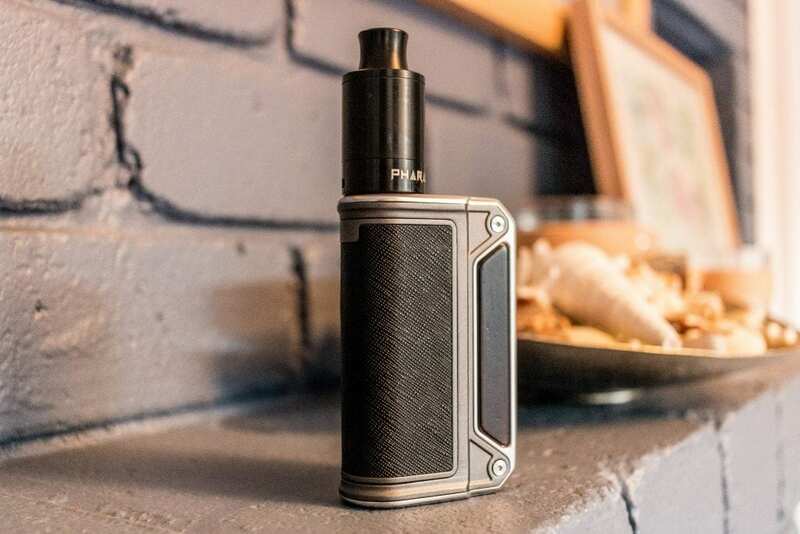 The newest mod in their Therion range is the Lost Vape Therion 166, which sports the latest DNA 250 chip which has been throttled down to 167 watts to be able to run with two 18650 batteries. Why is it called the Therion 166, when it peaks at 167 watts? I’m not sure and I don’t think we will find out soon. That doesn’t matter anyway. What matters is, how does this thing perform? 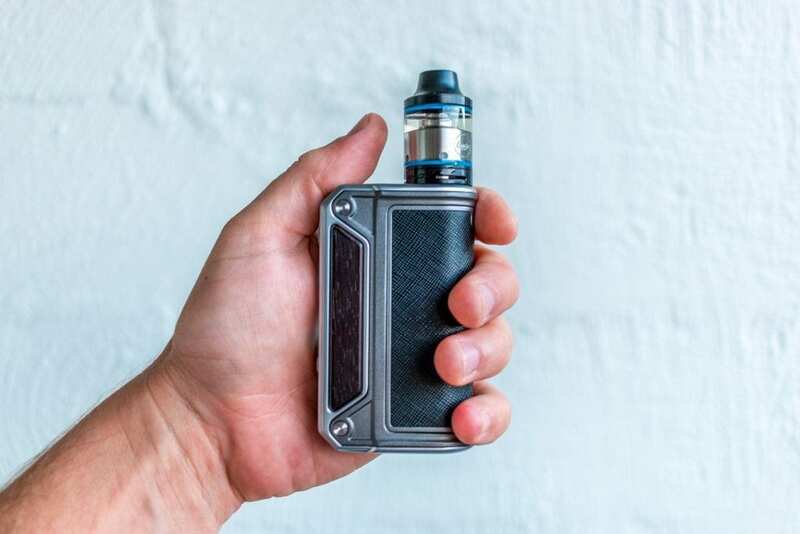 Made from a combination of various materials such as Zinc Alloy, Stainless Steel, Gold, Leather and Wood, the Therion is designed in the UK and manufactured in China. The Therion 166 has the ability to be customized via the Escribe software despite the fact it comes loaded with a bunch of presets already. I would like to acknowledge GearBest for sending the Therion 166 our way for the purposes of this article. 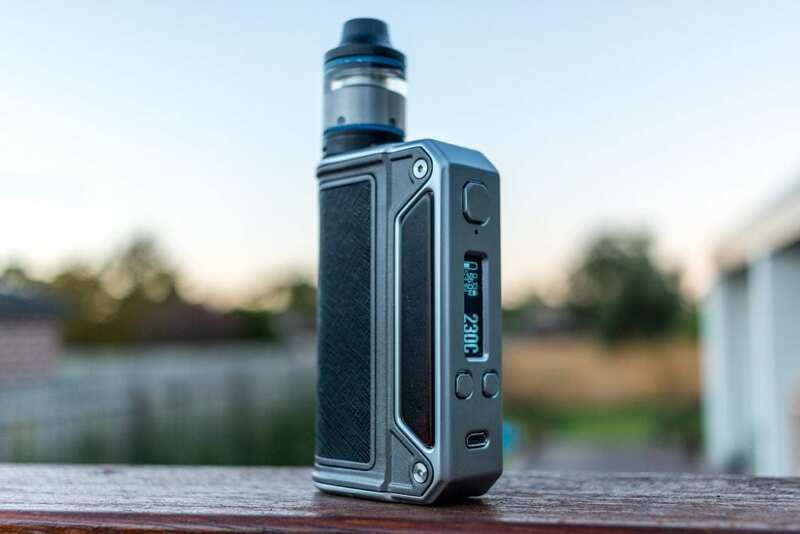 Click Here to Check Out The Lost Vape Therion DNA166! First up the packaging sets a really high standard of expectation for what is to follow with the mod itself. The box is stunningly well presented and looks the business. You know that feeling you get when your presented with a really, really good looking box – you know you’re in for a treat! If they pay that much attention to the packaging, imagine what the actual product will be like. Inside the box, the mod is firmly secured in a foam insert, so there is plenty of shock absorbency and no chance of the mod getting damaged in transit. Taking the mod out the box, you feel instant quality and top craftsmanship. The finish on the body is very smooth and inviting, this is capped off by very comfortable leather which is placed around the battery door. Lost Vape also provide the magnetic replacement doors in a variety of different finishes to customize the Therion even more. The silver version of the Therion comes with ebony wood inlays that initially look black, until you hold them up to the light and you can see a dark brown grain coming through. The mod is very visually appealing too, with dimensions coming in at 90.5mm by 54mm by 27mm.. Each part fits together in a flush manner and the there are no hard edges to be found. On the top of the mod, you will find the 510 connector which is held in place by three stainless steel screws. Along with everything else on the Therion, the 510 connector looks really solid and well constructed. It sits flush in the top of the mod and sports a spring loaded 510 pin – apparently made from silver plated nickel. The top of the mod at the connector area is around 25mm, so seemingly any atty up to that diameter is going to look good on this mod, without any overhang. With the majority of the body being made from die cast zinc alloy, there is not much weight in the mod on first inspection. It really feels very light. After installing the batteries, the mod tends to feel a bit more balanced. In no way is it a heavy mod, definitely on the lighter to lightest side of a dual 1860 box mod. A definite pro for me. The micro USB port is located at the bottom of the face of the Theorin and this can be used for charging the batteries or updating the mod through the Escribe software. There are three buttons on the face of the Therion 166, all which feel really nice and light. They are of quality construction which means that there are no rattles what so ever to be found. This is a huge pro to me personally as I hate rattly mods. The 0.91 inch OLED screen is nicely recessed into the face of the mod, it is very clear and illuminates with the perfect amount of brightness. The display offers all of the information you need including Voltage, Resistance, Wattage, Amps, Battery Life and Temperature (when TC mode is engaged). It advises if resistance lock is activated and will tell you if you are in a locked mode, which locked mode you are currently in. If you do not like the layout or the information provided by default, you always have the option to customize the screen layout via the Escribe software, to which you need a PC to make that happen. The Escribe software is still unavailable for MAC users, which is obviously a subjective con to some. Installing the batteries into the Therion 166 is quite straight forward. The orientation is clearly labelled and the batteries are inserted in a parallel configuration. There is a ribbon that is placed behind each battery to aid in easy removal. Initially when inserting the batteries, they can seem a little tight to get in, however I think that is a bonus because it ensures the batteries are firmly secured and will not contribute to any mod rattle. The battery contacts are 24K gold which makes for superior connectivity with your batteries. The mod appears to have enough air circulation around the batteries due to having a very open battery bay. I did not find the batteries to get hot at all when vaping, even at high wattages with an RDA for extended periods of time. Please be reminded that you need to utilize a married pair of high drain 18650 batteries on this device. Please see our article on battery safety if you need to brush up on any safety issues regarding batteries. The menu system its not complicated at all and quite easy to use for those that have used box mods before. One thing to keep in mind is that the Therion mods do not fully turn off. They can be locked or have the batteries removed, however when the batteries are installed the mod remains in a state of sleep only. This honestly took me a while to get my head around, as I like to shut my mod off fully before storing it in my vape pouch or pocket. But as long as it is locked, there is no fear of mis-firing when you don’t it want to. Five clicks on the fire button will lock or unlock the Therion 166. To lock the power, make sure the device is unlocked and hold down the plus and minus adjustment buttons. To lock and unlock the Resistance, make sure the device is locked and hold down the fire button and the plus adjustment button simultaneously. To put the device into Stealth Mode, make sure the device is locked and hold down the fire button and the minus adjustment button simultaneously. To change the temperature, make sure the device is locked and then hold down the plus and minus buttons simultaneously. The temperature can be adjusted in the menu and you can have it display in either Celsius or Fahrenheit or switch it off completely. To access the presets, make sure the device is unlocked then hold down the plus and minus buttons to access power mode and then double click the plus button. The default device presets include Wattage, Ni200, Ni200 No Preheat, Ni200 Relaxed, SS 316 and Titanium. I found that all of the preset modes work well without having to dive into customization with Escribe. There seems to be overkill on the Nickel options for my personal liking, I personally never vape Nickel, but again that is a subjective con to the way I like to vape and the coil material I use. Escribe is very straight forward to use and there are plenty of templates / preset options to choose from. And you have the ability to store/customize up to 8 presets. I usually vape SS316L claptons and it was easy to download a SS316L profile from Steam Engine and upload that into a custom preset. I was then able to select my standard wattage, along with a preheat curve that I desired. The software can record and tell you all types of information about how you vape and your mod, so if you find that interesting feel free to load that up. You can also configure Escribe to tell the Therion what batteries you are using, as to give you an accurate battery meter and help the charging process. The 510 connection is super smooth and accepted all the attys I threw on it with no gaps present. Every atty I put on the Therion up to 25mm looked good sitting on top. This mod really seems to style up any tank or RDA you choose to install on it. The Therion 166 really performed well with a wide range of my tanks and rdas. In both Wattage and TC mode I was getting a great vape out my Mage RTA, Smok Big Baby Beast & TFV8, Lemo 2, Kayfun 5 and Kanger Subtanks amongst others. Even when vaping RDAs at higher wattages, such as the Pharaoh Driptank, Mage RDA and Cheetah I was happy. I was getting an enjoyable and reliable vape out of them all, with one thing that stood out for me being consistency. Even Temperature Control mode worked very well without any hitches along the way. I did a few dry burn tests to which it passed with flying colors. The TC mode gives you a real time temperature reading as you vape telling you where it is at any given time. I honestly didn’t find any difference in TC mode if I locked the resistance or not, so I can tell you this mod is very very capable. I tested the accuracy of ohms against other mods, with the Therion being the most consistent readings. I didn’t have any connectivity issues with any of the attys is used on it. Nor did I have any ohm-jumping or inconsistent behavior whatsoever. This has to be probably the most stable mod I have used to date and it certainly is the most sophisticated. Battery life is excellent on the Therion 166, which boasts a 97% efficiency rating according to Lost Vape. The internal charging board features 2A balanced charging for both batteries, which means this is probably the only device I own that it is safe to charge batteries internally. Most mods on the market, it is not recommended to charge the batteries internally due to being installed in series and also having a lower than 2A charge functionality. Out and about I found the mod to hold up very well. I found the screen to be quite easily read in bright outdoor conditions, which is a definite pro in my book. A lot of other mods you would have to put your hand over the screen to see what it was reading. The Therion 166 holds up well in this department! The size and weight is no issue in regards to stashing it in either your pocket, bag or vape pouch. It doesn’t take up unnecessary room and has no catch points to snag on when your taking it out of your pocket for a hit. Being a lightly built mod, even with the addition of batteries, it is not heavy and will not weigh you down. It’s comfortable in your pocket or in your jacket due to not being overly bulky or heavy. I find the finish to be quite durable with no scratches or paint scraping off after quite an extended period of usage. I think the quality of the finish really helps here, as it is so smooth and well completed. Ergonomically, the mod is a dream to use. The curved battery door and contours of the mod aid in reducing fatigue to almost nothing. The weight and balance is spot on and can be used in either hand in any orientation. Safety wise, I feel at home with this mod. It has enough safety mechanisms built into it that I’m not even going to bother starting to list them. The batteries didn’t get hot, I got the expected error messages when I needed them and as the mod performs so well I am at ease with it not doing something unexpected or take me by surprise. 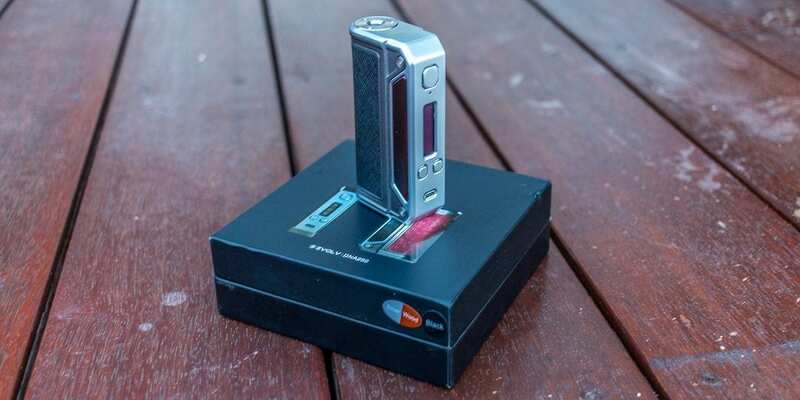 As a step up to it’s siblings, the DNA75 and DNA133 versions, the Therion DNA166 certainly is out to impress. Coupling the performance of the 250DNA chip and the quality of craftsmanship that has gone into this mod, it makes for an awesome vaping experience. The stylish elegance of the mod is truly customizable, with the addition of different leather battery doors. And the vape experience is also truly customizable with the aid of the Escribe software. You can take an already top notch mod and make it even better by customizing it to the way you want it. Granted it doesn’t come at a cheap price, however it is definitely something worth looking into if you find it of interest, as the satisfaction it can bring would be worth the cost. I have no hesitation to recommend this to someone who is in the market for a high quality mod, that wants the ability to customize their vape experience down to the finest detail. I hope this has helped you on your quest to find your next mod! If you have any questions or feedback, we would love to hear from you in the comments below.